Why are the unions so hostile towards the voluntary sector? Posted February 24, 2011 by Kaye Wiggins & filed under Uncategorized. 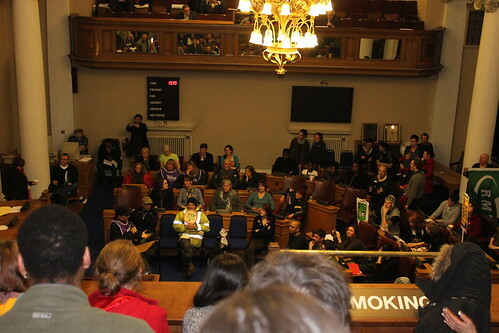 On Wednesday night I was at Lambeth town hall in Brixton, south London, where around 150 protesters occupied the council chamber during a meeting, forcing councillors to leave. The council meeting was to pass a budget that contained cuts of around £79m over three years. 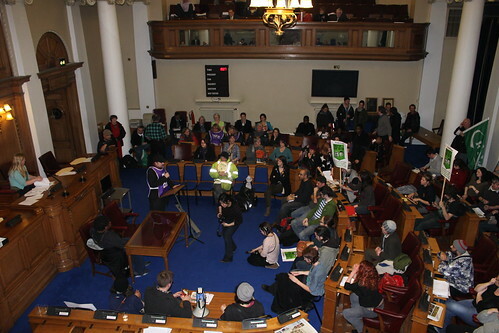 Once the councillors had left (to hold a private meeting at which the budget was passed), the protesters declared a “people’s democracy” in which everyone could voice their concerns. One of the many things that struck me during the protesters’ meeting was the unions’ reluctance to let the voluntary sector run services. When the protesters started talking about a council plan to let voluntary and community groups run the borough’s playgrounds, the reactions ranged from scorn to pity. Others took a more hostile approach, muttering loudly about voluntary groups “taking jobs” from the public sector. I hadn’t realised until last night how much of a problem this could be for the sector. Charities are under pressure from both sides of the political spectrum: those on the right think they shouldn’t get state funding in the first place, and those on the left think that when they do they are undermining the public sector. This could be a particular problem in Lambeth, where the council has a radical plan to become Britain’s first “co-operative council” in which services are provided by voluntary groups wherever possible. But I’m sure it won’t be limited to Lambeth. Reluctance, or in some cases open hostility, from those in the public sector – particularly when their jobs are at risk – must be making life hard for voluntary groups across the country. While the difficulties posed by this ‘attack from both sides’ are real, as a sector, we need to take some (not all – many voluntary orgs could definitely run a playground!) responsibility for this anger. Too often voluntary organisations delivering public services become less accountable than their public counterparts, in some situations have treated their workforce more poorly, and most importantly, have ended up mimicking the same institutional behaviour in their services that may have justified their initial move from the public sector and would have been their ‘added value’. But is that proven or assumed from what evidence … unions hostile towards voluntery sector. And what of the amount of cases before the Employment Tribunal involving voluntary sector organisations? I think there’s a tendency – exacerbated by some politicians – to equate the voluntary sector with unpaid volunteers. There’s lots of council services that I – as a social entrepreneur and trustee of a local CVS – don’t want to see run by unpaid volunteers. On the other hand, there’s a fairly high percentage of council services that potentially could be delivered by paid professionals working for voluntary sector groups. That doesn’t necessarily mean they should be – it depends on what the service and why voluntary sector groups might be able to do it better. Shamefully, the decision was welcomed by ACEVO, the charity chief executives club, who think it doesn’t go far enough. Now they are pressing for charities taking over public services to be able to strip transferring staff of their pension entitlements. And you wonder why the unions are hostile to the voluntary sector? My immediate reaction on reading this article was amazement that the writer didn’t understand why conflicts could exist between the TUs and voluntary sector. I checked her profile and saw that she is young, and will quite likely never have heard the arguments made by Trade Unions and public sector workers, since the media never report them. Thanks for all the other comments. I actually expected to read an attack on the public sector trade unions, which I’m so used to hearing in all other media. Public sector and voluntary sector workers need to stand together in fighting for excellent services, and appropriate terms and conditions for all workers. Very much agree with Andy Benson re ACEVO.